With tears flowing down my cheeks, I immediately emailed the rescue. They rescue pets out of high kill shelters in Kentucky and bring them to Maryland for adoptions. Buttercup wasn’t in one of those shelters, but the rescue was asked to help find her a good home. Buttercup’s story starts on the streets with her sister. A poor elderly woman saw these kittens hanging around her porch. She had an indoor cat. She would share her cat’s food with these kittens outside. She contacted the rescue since she didn’t have money for food for everyone, and the rescue contacted a foster mom to take the kittens until a good home could be found. The kittens were spayed and cared for at the foster mom’s home. This is how Buttercup and her sister ended up on adoptapet. We filled out the pre-approval forms and emailed them in. Phone calls and interviews were done and we were placed #1 to visit and have first chance at adopting her if she is a match during the meet and greet. We drove 2 1/2 hours to the meet and greet. Of course we fell in love with her immediately and brought her home! Poor little girl had quite a ride that day… from Kentucky to Maryland, and then another 2 1/2 hours to our home, but she traveled very well. We took her to meet our vet in the next couple days for the required exam. The vet found some health issues, along with lumps in the inguinal area. The first thought was this was something from the spay and she was prescribed antibiotics for 10 days. The inguinal lumps continued to grow and became the size of small chicken eggs, one abscessed and oozed. Our vets were baffled. They did cultures and biopsies of the lumps. While we were waiting for the results, the vet put her on a different antibiotic as a precaution. Meanwhile, we were asked to see if we could find anything out from the rescue about the environment she was kept in, etc., that may give us a clue where to go with treatment. My vets never saw this condition before. I made several calls and emailed to any place I could find in Kentucky that might know if there is something specific to that area that could cause this. All the replies I got said they never heard of this either, and weren’t familiar with anything that might be specific to the warmer Kentucky climate that may cause this. The replies I received were disheartening. Vet clinics down there also never heard of this before and didn’t know of anything specific to Kentucky that might cause this. The culture results came back and showed nothing. We waited an additional week for the biopsies’ results. A diagnosis came back with the results, severe pyogranuloma of the inguinal fat pads. 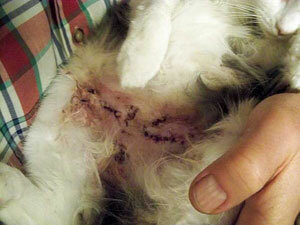 The biopsies did not show what might be causing this. Our vet consulted with an animal dermatologist. He said if this is mycobacterial or nocardia, 70% of the time no stain used in a biopsy will show them and that he usually has to go by presentation of symptoms. With Buttercup’s presentation, he feels this is what it is. Unfortunately there is only a 50% chance of survival because cats with this have to undergo a long duration of antibiotics and most can’t take it, or the lumps keep growing and causes intense pain and oozing, etc. For people who can’t afford the sensitivity test to identify which antibiotic might have the most success ($500 test), he goes right away to Veraflox ($50 a month). He has had cat patients on it for 2 years already. This is a long term condition if she lasts through it, and there is always the danger of her coming out of remission and the bacteria *winning* again if she is one of the surviving 50%. Now that we had an idea of what this could be, we spent a lot of time researching to see what we could do to bring the odds more in her favor. I will share links of what I’ve found at the end of this page. Please be patient for me to organize them and add them. 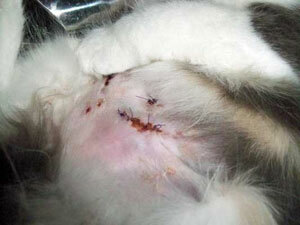 We are hoping to bring an awareness to this condition and educate on the essential aftercare of spaying/neutering. I will update this page, below, as we go through her treatment, add pictures and more links. Update March 17, 2015: Buttercup is taking her medicine like a champ, she goes back to the vet for a checkup, to measure the lumps and CBC. I will report back on how things are going with her treatment and add some more pictures of my gorgeous little girl. ♥ We are thinking of putting up a facebook page for her. Any thoughts? Good idea, bad idea? Update April 9, 2015: The last couple days we’ve been finding some tracts scabbing over. So she has been oozing some… BUT, they are scabbing over and not continuing to ooze. That has to be something positive. We will keep on with her treatment and supplements and share what the next vet visit shows. 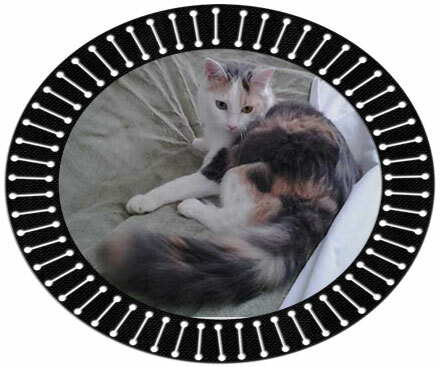 Update April 26, 2015: Now the details of Buttercup’s vet visit last week. The positive side is the left granuloma is a little bit smaller. Unfortunately the right one grew a little, but only on the bottom. Another positive, is Dr. Rosenberry (vet) said they don’t seem like they are angry anymore, it is as if they aren’t swollen and inflammed like they were. Buttercup’s blood work is still in the normal range, so her long term antibiotic therapy isn’t affecting her WBC or other things. Dr. R. added another antibiotic to take with the current one, so Buttercup is now on 2 antibiotics. 2 or even 3 antibiotics are recommended when dealing with vicious almost-indestructible myco-critters. Now that we see Buttercup can handle long term antibiotic therapy at this point, an additional antibiotic in her arsenal might fight these critters even more. Her next appointment is the end of May. We came away feeling feeling good. Update: December 23, 2015: We have been taking Buttercup to her favorite vet for all of these months and we continue to see improvement to the point that there is no lump on the left side anymore! WooHoo! The antibiotic and nutritional therapy are doing something! 🙂 Now if only the right side would cooperate as much. 😉 It is getting there, but just a little more stubborn than the left. We took down her facebook page. It didn’t bring the traffic we thought it would to get the word out about proper after spay care and the dangers of mycobacteria. Oh well. Mycobacterial Infections(brief snippet) “Other fast-growing opportunistic and species. 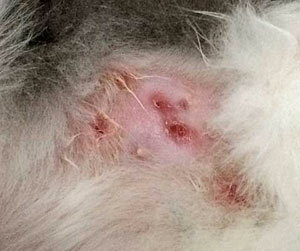 Soil and water exposure; bite and puncture wounds; immunocompromised host Cutaneous and subcutaneous granulomas, especially inguinal region,ulcers, drainage, with regional spread only Surgical removal, wide excision, variable susceptibility to fluoroquinolones, doxycycline, aminoglycosides, clofazimine, clarithromycin,trimethoprim-sulfonamide”. This is a very large file, and worth downloading to read the entire thing. Nutrient Acquisition By Mycobacteria (very interesting!!!) Long, detailed explanation how nutrients cross the barriers to feed these myco-critters. If you find it difficult to understand why treatments often fail… this will help you understand the fight we are up against with these well protected organisms. I highly recommend this reading. Effects of Omega -3 and Omega -6 Fatty Acids on MycobacteriumThis had my hopes up at first, but perhaps if they continue their studies something definite can be determined. More links and information to follow…. We sincerely thank everyone for their support and following along in Buttercup’s journey to health. Please continue to support and adopt from Rescues. What we are experiencing is not the norm, but it comes up from time to time. We view this experience as something to learn from, to benefit others, bring awareness so someone else doesn’t have to delay treatment because of being unsure what is going on… or worse yet… start a treatment that would be opposite of what should be done. 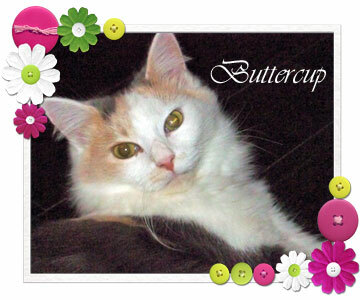 Thank you for taking the time to read Buttercup’s story.